Stand up! Cast your first-round 'Countdown' votes by Wed. In less than one week, more than 60,000 votes have been cast by some 5,000 drum corps fans to select the corps performances that will be seen up on the big screen Wednesday, May 13, when Drum Corps International's spring cinema event, "The Countdown," appears in theaters across the United States. With early indications that the 2009 event will be among the most popular in "Countdown" history, you won't want to miss the excitement and the opportunity to voice your opinion by selecting which corps performance should make the cut. If you haven't already voted, there's still time for you to join the legion of passionate fanatics who are already counting down the days to the start of the 2009 Drum Corps International Tour by taking part in "The Countdown"! In the first round of fan voting which will end at noon Eastern on Wednesday, March 4, you have the opportunity to choose your 12 favorite corps performances from a list of 72 World Championship Finalists from 2003 to 2008. Soon after the first round ends, you'll have a second opportunity to vote, choosing your six favorite corps from the 12 finalists. 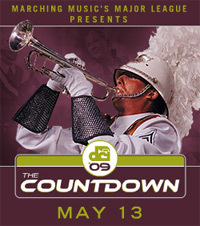 Tickets for "The Countdown" will go on sale through FathomEvents.com on Friday, April 10, before you help us kick off the countdown to the 2009 Drum Corps International Tour on Wednesday, May 13, with this very special cinema event! Visit DCI.org/countdown to cast your first-round votes!